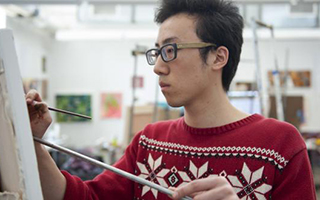 One of the most comprehensive, exclusively studio-based art departments in the U.S., the Department of Art offers undergraduate programs that are recognized nationally and internationally. The department is a community of professional fine artists, dedicated faculty, skilled staff, accomplished visiting artists and engaged students. The Department of Art is broad based, discipline intensive and boundary pushing and is a modern laboratory in which to create and explore art and ideas. Through the production, examination and evaluation of the visual arts, the department serves as a place where students and faculty can experiment with material and content, and where a diverse audience can take part in our exhibitions, public lectures and educational programming. The undergraduate degree programs and the minor program are accredited by the National Association of Schools of Art and Design (NASAD). The BFA in Art is the professional degree program that prepares students for diverse careers through specialized studio training. The prospective student must complete a sequence of core courses during the first and second years of study. During the second year of the program, students prepare their portfolios for review and acceptance by a specific area of emphasis in the BFA degree program. 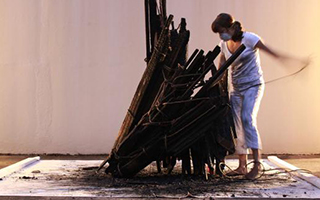 The BA in Art is a liberal arts degree program that serves as a general introduction to the experiences of the artist. This program of study includes a range of studio practices in all areas of the department and in art history and theory. The curriculum develops creative problem solving skills that can be applied to a variety of careers. For more information visit the Department of Art website or view the university's major curriculum sheet. Have a question about Art or want more information? Let us know. 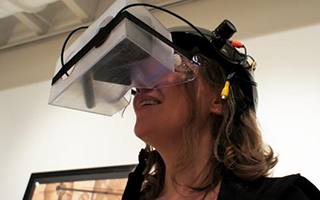 An emphasis in Art and Technology allows students to focus on the creative use, misuse and investigation of technology in an art-making practice. Students engage the meaning and material of science and technology through the production of interactive installations, electronic objects and interfaces, moving images, 3D modeling and animation, art games, tactical media, bio-art, performance, digital imaging, rapid prototyping, holography, Internet art, sound and emerging forms. Advanced technologies are explored as creative tools and as agents, which can lead to the production of new meaning, ideas and artistic invention, all central to contemporary art. 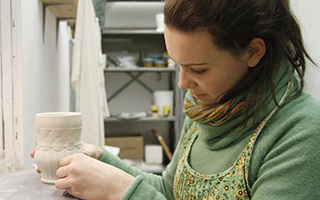 The Ceramics area is one of the oldest, most complete and diverse programs in the country. Its history includes many artists important to 20th century ceramics. Each student is encouraged through a supportive environment to develop a particular aesthetic that relies on persistent curiosity and hard work. Students in the area are exposed to a wide range of traditional and contemporary concepts and techniques, and are encouraged to take independent study hours with visiting artists and faculty. 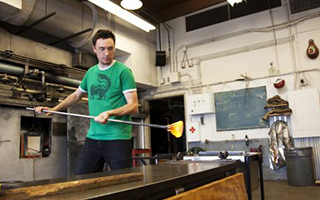 The Department of Art operates one of the most comprehensive studio glass facilities in the United States and offers a broad art training, coupled with a focus in glass practice, integrated within a science and humanities curriculum that is designed to prepare students for varied roles as practitioners, innovators, and leaders in the field. The undergraduate glass student receives practical instruction in a full range of glass working processes and becomes familiar with the use of glass-forming equipment, leading to independent creative work and research. The Painting and Drawing emphasis area in the Department of Art supports the investigation of many approaches, histories, and forms of painting and drawing. A diverse faculty brings a broad array of voices to individual study. Painting and drawing are viewed as independent but overlapping disciplines, and the area provides a wide range of courses designed for students of all levels, backgrounds, and interests. Photography has a long tradition at The Ohio State University dating back to the 1890s. 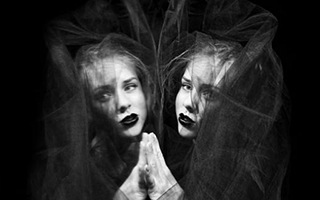 The Photography Area is committed to a continuous exploration and redefinition of what it means to use photography as a personal and critical endeavor. Part of the strength of our program comes from being part of a large university community. We encourage interdisciplinary practice not only with other areas in the Department of Art, but also with areas outside the department. 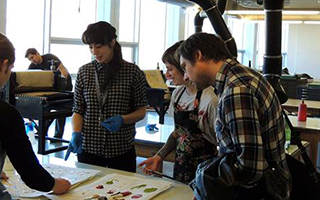 The Printmaking emphasis area operates as an integrated community, including all students in a critical environment of class, workshop, and dialogue (critiques or other). The graduate program and the undergraduate program stimulate and complement the development of ideas within this community of artists/printmakers. Community service and professional interaction are enhanced with a visiting artist program that emphasizes the production of new works in print. The field of sculpture has undergone significant changes in concept, materials, and techniques over the last century. Traditional concerns have evolved to include site, language, sound, time, light, and movement, enabling our sculpture students to develop new ideas and approaches with their interactive installations, performance, video, social practice, and hybrid forms of art. Interdisciplinary investigations and collaborations are encouraged. The Department of Art at Ohio State facilitates students’ acquiring the visual skills and manipulative and conceptual abilities necessary to create works of art. The diverse faculty is comprised of professionally recognized artists dedicated to the craft of teaching. The studio facilities, located on the Oval and West Campus, are excellent. The department also maintains an active exhibition schedule in its own galleries and critique spaces supplemented by the Urban Arts Space in downtown Columbus, and the highly publicized Wexner Center for the Arts. Art provides students with unique, creative approaches to problem solving and project management, and is good preparation for a number of careers. In addition to establishing careers as artists, recent graduates have entered such diverse professions as law, medicine, architecture and fund-raising. Many art majors also eventually find their way into arts administration positions, either within museums, galleries, or public agencies (such as state or city arts councils) or within educational institutions. An introduction to the principles of sculpture, emphasizing basic forming processes and materials. Introductory experiences in the traditional processes of lithography and screen-printing and their application to non-traditional approaches. Introduction to the art practices of high fire temp ceramics; lab practices with various modeling and potter's wheel techniques with lectures covering a broad survey of the field of ceramics. Readings, lectures, discussions and field trips will introduce students to a diverse range of ideas, processes and contexts shaping the experience of visual art today. We offer a variety of opportunities. Past trips include Berlin, Germany to explore the city and focus on aesthetic approaches of cognitive mapping. Next year students will travel to Siena, Italy to explore the influences of ancient art on contemporary art focusing on the practices of walking, art, and ritual. The Department of Art houses several student organizations. They include the Art & Tech Student Club, Glass Club at OSU, OSU Photo League, Student League of Independent Ceramists, Student Printmaking Association, the Undergraduate Student Art League, and the Undergraduate Student Painting and Drawing Club. Students can enroll in ART 3191 in order to receive academic credit for an internship through the support of their academic advisor, course instructor, and an internship supervisor. This is a great opportunity for students to gain real-world, practical experience that will have a direct impact on their future endeavors.